Driving back from the dentist when I saw an unfamiliar CVS, so PITA and I stopped in – – motherlode time! 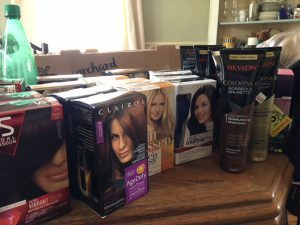 Used mfr coupons with my stack of $3 Beauty Club ecbs (but not my one remaining FREE hair color item coupon) and submitted to Ibotta, which paid me back $7.50 so fast I thought there was a glitch! Total OOP before tax was $2.10 and you can certain I’ll have another bunch of freebies and Beauty Club ecbs when next I scan.